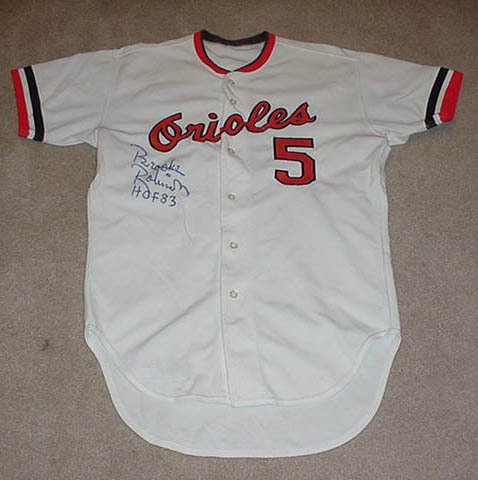 Take a look at this authentic jersey worn by Brooks Robinson while he played for the 1977 Orioles. His autograph was obtained and is in clear blue ink on the front of the jersey. Brooks Robinson played for the Baltimore Orioles and was a member of the 1966 and 1970 World Champion teams. Brooks is also a member of the National Baseball Hall of Fame. Although we doubt you would actually wear this jersey, the size is a 42 and produced by Rawlings. This jersey is available on eBay for $14,995. Take a look at some more deals on Autographed MLB Jerseys.